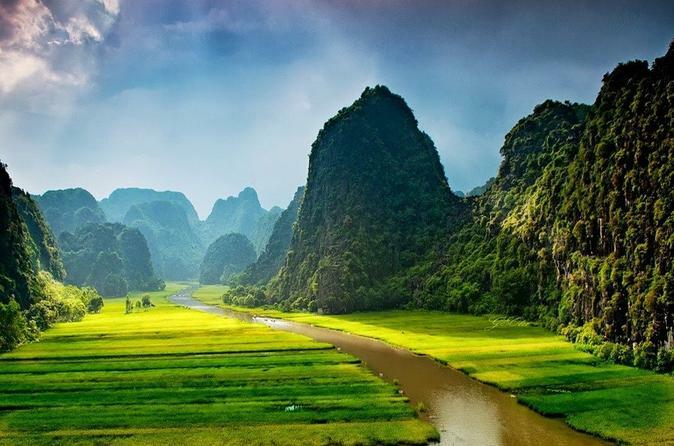 Discover the highlights of Ninh Binh in just one day on this door-to-door guided tour that covers the ancient capital of Hoa Lu and the karst landscapes of Tam Coc. First, learn about the rich heritage of Hoa Lu. Then, enjoy a buffet lunch of local specialties before you cruise the Ngo Dong river through startling rock formations and ancient caves. Ppl tell me that Hoa Lu is the Ha Long Bay on land, then I know why they said that. No doubt that this place brings me a lot of the beauty of nature. Thank you so much for the services. I have a great time on boat with the local ppl. Excellent ,Great Worth a full day for relax detour for this, highly recommended. The tour was great! However you might want to come in months when it is not rainy. It was raining when we had the bicyle and boat ride at tam coc. 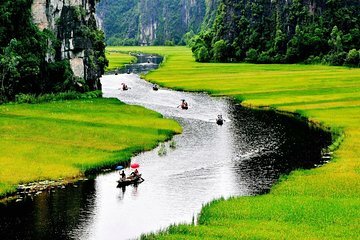 Wow by the beauty of nature and serenity.The 1 day tour was arranged by Local travel from Hanoi. A 3 hours bus ride from Hanoi inclusive of 1/2 service stop. We enjoyed cycling in the village and thru the green paddy. Stop as wish to immerse in the serenity of nature. Along the way, visited a local family to learn the local way of life - simple life but very happy.The 1 and 1/2 hour bamboo boat ride on the long winding river and thru the 3 caves was another enjoyable activity. Both sides of the river are green paddy fields and surrounded by limestone hills. Time flies when one was enveloped in the nature of beauty. At the end of the trip, prepared to give the boat man a small token to thank him for a safe journey. Hassle free trip, went out of their way to pick us up out of our hotel even if it was not on their list of hotel. Guide was great, tour itself was fun! Purely amazing! The scenery blows you mind! This tour has NO negative comments from me! This is a great Hoa Lu Tam Coc Day tours. It's an easy bus ride from Hanoi and well worth the money. The guides take really great care of you and the sites we visited were very interesting. Hanoi can be seen in one day so take advantage of your stay to go on tours outside Hanoi.Highly recommended. Halong bay on the land -Wow by the beauty of nature and serenity.The 1 day tour was booked via online .A 2,5 hours bus ride from Hanoi inclusive of 1/2 service stop. We enjoyed cycling in the village and thru the green paddy. Stop as wish to immerse in the serenity of nature. Along the way, visited a local family to learn the local way of life - simple life but very happy.The 1 and 1/2 hour bamboo boat ride on the long winding river and thru the 3 caves was another enjoyable activity. Both sides of the river are green paddy fields and surrounded by limestone hills. Time flies when one was enveloped in the nature of beauty. At the end of the trip, prepared to give the boat man a small token to thank him for a safe journey. Highly recommended. Wonderful services .Excellent one day Mekong delta trip!I booked this trip and was really pleased I had. Was with a small group of mixed nationalities and the tour from our wonderful tour guide Thao and the driver were excellent. The organization was brilliant and all the information that Thap gave us during the day was very informative. Really recommend the trip.